Recently appointed Monitoring MP Mohan Lal Grero spoke to the Daily Mirror on his reasons for crossing over to the side of the government, his vision for the educational system of this country and the issues of the university lecturers. Q: Can you start by explaining your reasons for crossing over? A: Well actually I entered politics because of my experience and knowledge in the education sector and I thought that I could do some service to this country, that was my aspiration and whole objective of getting into politics. It was not to achieve any political perks; it was to serve the children of this country. Q: Why did that have to entail crossing over? The UNPers voted you in to work for the children. A: Well after entering the parliament in 2010, I had the opportunity to participate in the sessions of the Special Education Committee of the parliament, which was headed by the Education Minister Bandula Gunerwardene. I participated in about 25 sessions where very eminent educationalists and so many other religious leaders and leaders of different societies came in and discussed and argued about the Mohan Lal Grero educational policies of this country, to develop a new national educational policy. Therefore now very efficient and eminent education policy is emerging and has actually emerged. I then saw that my dream had been realized, however there have to be individuals who are really devoted and dedicated to implement and make this dream a reality. Therefore I thought that even though I entered politics from the UNP, this is what is requested from my voters-some service to the education sector and to uplift the education system for their children. Ultimately I thought that this is the opportunity for me to support the government to do this. 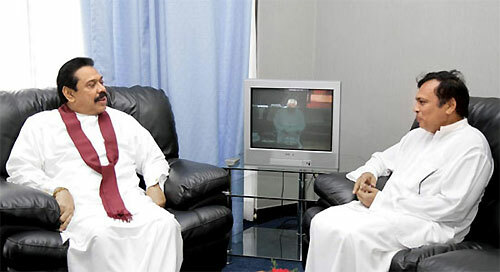 Q: You were elected from the UNP only one and half years ago, you were well aware of the situation at the time. Why did yo contest with the UNP? A: I did not know whcih party was going to come to power. I know that people are slinging mud at me and insulting at the moment, but I thought that I would face all those thing for the benifit of the children of this country. I contested with the UNP because I was invited. Q: Did you think at any time that you would have to cross over? A: No, because at that time this special education committee was not there, it is then that I realized that all these matters are coming up. I also had my own plan and ideas of a national educational policy and I shared these ideas in the past one and a half years and all my ideas were taken in from the government. I didn't know whether the ruling party would even win and form a government. Q: Then was it always your intention to be with the party that won, in order for you to implement your policy? A: No it was not. Q: But you just said you don't know which party would win. A: I didn't know who would win and that they would start this special educational committee and formulate a new education policy and I did not know that the structure which was in my head would work out as smoothly as it has and things would fall into place the way they have. Q: You don't think there is any moral dilemma in crossing parties? A: There is, but I thought that I would sacrifice all those things for the benefit of the children. Q: You decided to sacrifice your moral obligation to the party and the people who voted you in? A: I had a higher moral obligation to the children of this country, as an educationalist. I had to balance both these aspects and ultimately my moral obligation to the children of this country way outweighed my obligation to the party. I also sacrificed my self-respect and I knew that I would get insulted if I crossed over however when I weighed that with the four million children of this country who are yearning for a better education and the children far outweighed the other considerationstherefore I could not resist. Q: People say the only reason you crossed over was because you were offered perks. How do you respond to that? A: No, nothing of that nature was offered. I am only expecting some authority to look after the planning and implementing of this particular plan, especially the 100 secondary schools which they are planning. It is an idea much like that of CWW Kannangara's who constructed 53 central schools, here there are 1000 schools, therefore I thought why not contribute something to this project. Q: How long did you consider this move before crossing over? A: Well when the education policy was coming together quite nicely I was very happy and I asked if I could contribute and work on this project, but then the answer was that only my ideas would be taken into account, I would not be allowed active participation so long as I was in the opposition. Q: So the government officials then told you that crossing over was the only way to see your ideas implemented? A: Yes, that is right. In order to actively participate in the implantation process I had to cross over. Q: A few months back during the Municipal Council Elections you had a disagreement with the party and you threatened to resign. Did this have anything to do with your crossing over? A: No, nothing at all, as I said education reforms was the only reason that I crossed over. That was a minor issue with regard to the policies of the party. They gave me a solution for this situation and that was over. Q: Do you think UNP is beyond repair? A: No, not at all. I think that the UNP is a sleeping giant, with the unity of these leaders they will be fine. It is always a cycle, they can always come back to power. Q: It was not the weakness of the UNP, that caused you to cross over? A: No. I have to tell you some another factor, I am 56 years old now. I have some other plans in my life and after 60 years I have another plan. Therefore I only have 4 years to do something for the education sector, so that is another reason. Therefore the time factor is also a concern. I thought that whatever the repercussions, even if I fail I have to try. I know that regardless of what others say I can be very happy, because I worked with dedication and truthfully. Q: What is your plan after 60? A: It is something to do with religion. Q: Do you feel that your opinions were taken into account when you were in the UNP? A: Yes, most of the time. My ideas cannot be accepted all of the time but I would say 90 per-cent of the time. I was ok with all of the members of the party, they accepted me with a lot of kindness-that warmth was there for me in the party. Everyone liked me, because I had no cliques. Q: How that you mentioned it, what was it like to leave the party that was so welcoming to you? A: It was very sorrowful and I had a very sensitive reaction in my mind, when I was announcing that I would support the government and vote for the budget. Q: What are the exact points in the budget that elicited such a strong response from you? A: It was not the budget actually, it was the education reforms. Although it is not mentioned in the budget the government had already requested soft loans, from different institutions for 600 Million USD. I knew this was coming. Q: This government has been criticized for not dealing with the issues of the university lecturers. this budget does nothing to address their grievances. As an academic do you side with them? A: All those matters are in the new system. We have introduced a method of grading them and providing them with adequate promotions. Q: Will this solve their immediate needs and provide their immediate demands? A: No, nothing will happen overnight. But when this new system is implemented everyone will get what they deserve, according to the grading system.